Chiang Kaishek and the Kuomintang: Anti-Communist Allies or Chinese Mafia Thugs? Anti-Communist Allies or Chinese Mafia Thugs? This article has been rewritten to correct the alterations and distortiions added by hackers during a hacking attack between 2005 and 2007.. NOTE: The injustices of abuse of disfranchised Chinese railroad workers in the 19th century, and the Internment Camps in the United States for East Asian ethnic Japanese in the 1940s, during a time of war, should be fully recognized and not repeated. This article identifies a highly affluent and corrupt privileged class among Chinese society whose wealth has been built on large-scale, politically entrenched banking and real estate grabs, along with more sordid international narcotrafficking and underground weapons sales and virtual slave trade in some cases. This information should not be used to promote racist attitudes or inaccurate generalizations about the Chinese or any other social group. Cries of 'racism' have been used to divert attention repeatedly from the rampant white-collar and blue-collar crime in North America committed by a well-networked ethnic Chinese mafia that now has taken its place alongside the old Eurofascist mafia networks as a very formidable corrupting force in North America, particularly powerful on the Pacific Coast. Its alliance with the more corrupt elements of American politics is of particular concern, and includes historical alignment with the Japan Fascist Party, German Nazi Party, and their surviving post-1945 financial empires, some largely underworld, since each Axis fascist party was heavily fused with local mafia elements. Is the recent wave of propagandistic slander against Franklin and Eleanor Roosevelt funded by these old financial interests who are seeking to undo what the Roosevelt administration accomplished in terms of the resolution of the disparity between wealthy business interests and the rest of society, and turn the clock back to the economic injustices and corruption of the 1920s when gangsters ran the streets? There seems to be much evidence to validate that this is the case. Other powerful and obscured political links in Washington to the old Nazi corporate and banking money could be relevant to the following, as well. Part of the 'trick' is the same tactic used in other areas of the USA by its politico-conservative allies... religious and other supposedly non-profit organizations and fronts providing immunity to investigation of large-scale financial corruption and money-laundering. The United States has, nearly from its birth, been a multicultural nation. And while cultural and ethnic tolerance are essential, corruption -- including well-networked organized ethnically-defined criminal activity -- should not be tolerated or allowed to fester while minority legal rights are abused by the unscrupulous so that criminal investigators are stymied in the process of investigations and cleanup. The Generalissimo Chiang Kaishek (Jiang Jieshi) was chief (with various titles over time) of the Chinese Kuomintang (Guomindang) Party, which drew its roots from the Revive China Society founded in 1895, and the Revolutionary alliance founded in 1905, for many years funded by and interlinked with the massive financial empire of Chiang's multi-millionaire banking-real-estate mogul uncle T V Soong, father of the famed "Soong Sisters", and overlord of the "Soong Dynasty". As a whole, Chinese culture is indeed quite different from most 'western' cultures -- it is important to realize that an overt virtual feudal system with regional feudal 'warlords' continued in mainland China all the way up to 1950 (while the USA had a democratic revolution in 1776, France in 1789, nearly 200 years earlier to begin dispelling the inequities and corruption of feudalism). Now that mainland China is becoming wealthy and powerful, the Kuomintang is forming overt and covert alliances with the Chinese Communist Party to share Chinese national wealth, evidenced by an agreement signed between the Kuomintang and segments of the Chinese Communist Party on 2005.Mar.28. As China shows potential for becoming a major world power, we need to assess the historical background of Chiang Kaishek's Kuomintang party, its ultraconservative alliances, and their underground remnants, very carefully. Here, we will take a look at both the chart of Chiang Kaishek, and of the Kuomintang Party and its relationship to its various power-bases. Because birth times in China were long often rounded off to the beginning of the hour, one hour variance was for the 12h00 birth time quoted by Chiang Kaishek, per Brotherhood of Light records. With such a large leeway needed for variation from the reported time, I first looked at solar arc directions on the 360° chart for the dates of death and of marriage to his last wife. d(MA/SA)=MC at his death, and d(SU/MO)=MC at his marrige to Sung Meiling led me to start with an MC of about 52.00, therefore about 12h42 LMT. Now on the 90-degree chart with dial, I continued to look at other events, and ended up deciding that 12h42 LMT would indeed be the birth time, and would allow for a midpoint involving Mars (MA/SA… a disciplined configuration appropriate for a military man) on the MC. * Among Chiang's other accomplishments was receipt of an honorary degree from Bob Jones University, a "Christian" school which prohibited Black/African-American people from enrolling until 1971, and which allowed only married Black/African-Americans between 1971 and 1975. Interracial dating is prohibited as of 2005. Its biology department teaches 'creationism'. Television, as well as jazz, new age, and rock music are prohibited in residence dormitories. BJU hosted Ronald Reagan, Jack Kemp, and Bob Dole as speakers during their political campaigns. Other honorary degree recipients include ultra-conservatives and apartheid advocates Ian Paisley of the Northern Irish Unionist Party, Governor George Wallace of Alabama (vehemently racist and fan of the Kukluxklan during his US Presidential bid), Governor Lester Maddox of Georgia (vehemently racist), and Senator Jesse Helms of North Carolina (who referred to the University of North Carolina (UNC) as the 'University of Negroes and Communists'). The Kuomintang has routinely made political and economic alliances with right-wing extremist organizations in the United States, and is itself highly ethnocentric and racist... its businesses routinely shunning Blacks and Hispanics, and providing Whites with 'leftovers'. The 12h42 LMT rectified time (reviewed afterward and validated by Ruth Brummund), also correlates quite well with characteristics of Chiang’s life. AS=MO/VEJUAP Chiang was a lady’s man and had several concubines at the time he requested Sung Meiling’s mother for her hand in marriage. Sung's father was reputed as the wealthiest man in China and later the Finance Minister of China whom some claim kept him in office, and Chiang's his marriage to her, due to the Chinese family patronage system, essentially insured unending success for the rest of his life, as did his Shanghai Stock Market connections, and powerful underworld connections in both China and Japan (which ruled Taiwan and handed it over to him in 1945). 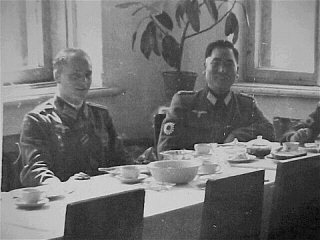 AS=PL/KR Chiang experienced many major changes in relation to official/government matters. He joined the Japanese Army (instead of that of his own country) in 1909, returning to China in 1911. Upon his installation as president, the Chinese capital moved from Beijing to Nanjing, then to Chongqing, then back to Nanjing, then the Kuomintang capital to Taipei. MC=HAZEKRVU Military leader, president, ‘generalissimo’, but always of a relatively corrupt government, including close ties with the Green Gang and other Chinese Mafia circles, particularly those involved in opium trafficking, both before and after his political office. During Labor Strikes in Shanghai in 1927, Chiang followed Mussolini’s and Hitler’s strategies and had the Green Gang take over and in effect neutralize the labor unions by coercive measures, as a favor to Chiang's Shanghai business connections, many of them non-Chinese. Chiang Kaishek's son, Chiang Weikuo, here in Nazi uniform, joined the Nazi Army for the 1938 Austrian Anschluss. He was later Secretary General of the Council of National Security of Taiwan. 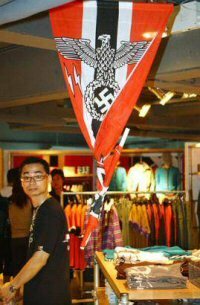 After Nazi connections publicized in recent years, suddenly he is "not really Chiang's son" and disowned post-mortem to "save a face" of the family. Chiang was given control over a one-party state in 1929, only 2 years after his installation as president, and this continued in essence until his death in 1975. Note that his title, "Generalissimo", was used only by one other well-known world leader, Francisco Franco of Spain, who also had close ties with Nazi party and Italian Fascist party in the 1930s. Such were Chiang’s ties to the Axis powers that he sent his son to train in the Nazi military and take part in the Austrian annexation of 1938. During World War 2, substantial war aid, particularly American, was provided to Chiang and the Kuomintang Party in hopes of gaining his allegiance to deter a communist takeover of China. As Chiang had earlier been a member of the Japanese Imperial Army, and made alliances there, when Japan invaded China in the 1930s and tempted Chiang with sharing a ‘Great East Asia Co-Prosperity Sphere’, Chiang got the best of both worlds by moving his capital to Chungking (Chongqing) to continue receiving massive American aid, while another branch of the Kuomintang under Wang Chingwei collaborated more overtly with Japan while setting up a Chinese Axis-collaboration government in Nanking (Nanjing). Thus, one half of the Kuomintang government got American aid while the other half got Japanese Fascist assistance. American military advisors were subsequently in continual disbelief at how Chiang's Kuomintang army seemed to offer practically no resistance as the Japanese Imperial Army (which Chiang was earlier a member of) advanced into China. General Joseph Stilwell of the US Army, personal attaché of Chiang Kaishek, saw the intense corruption and duplicity of the Chiang-Kuomintang government and discouraged financial support for it, but a deaf ear was turned to his emphatic recommendations, due to fear of a communist takeover otherwise, and since the Kuomintang slandered General Stilwell (their critic) for being 'rude and insensitive' and 'difficult to deal with'. The rampant corruption of the Kuomintang Party under Chiang was such that it drove the Chinese populace into the arms of the communist dictatorship of Mao Zedong, who prevailed largely due to his treatment of the bulk of Chinese society under his sway -- contrasting sharply with the arrogant privileged elite class surrounding Chiang and Chinese Finance Minister, banker, and real estate magnate T V Soong while in mainland China. Due to Chiang's espousal of vehement anti-communism, appealing to western sensibilities, he continued to gain substantial support of American politicians, which began to wane as news of the duplicitous corruption was ultimately verified by ethnic Chinese-Americans. After the Soong family's explusion out of mainland China, it and its and associates took its millions to the United States (as well as to Singapore and Hongkong and Taiwan), set about immediately lobbying in Washington to persuade the United States to invade China and restore the Kuomintang to power, and began investing in American real estate to replace its earlier holdings in China. Had the money not also been derived largely from narcotics trafficking, a grossly elitist, hierarchical, and ruthless landowning system, and outrageous nepotism and cronyism within a clearly undemocratic government, this might not have been such an controversial issue among American political figures who knew the facts. Chiang's Involvement in black market activities is also validated by MA=MCHA/AP. 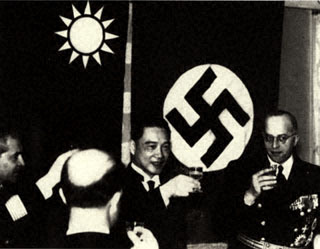 The old Shanghai Green Gang Mafia left mainland China with the Kuomintang and came under control of Chiang's colleague Kuomintang General Kot Siu Wong, and a subgroup of the old Mafia, extensively entwined in Opium Triangle drug trafficking, became know as the "14K Triad" or simply the "Triad", which resettled in Taiwan, Hongkong, Macau, Singapore, and northern Thailand, as well as in metropolitan San Francisco USA and Perth Australia. The huge opium processing laboratories of Shanghai transferred primarily to Hongkong, and the profits continued to funnel into the Kuomintang Party. The Kuomintang Army literally patrolled and controlled the Opium Triangle, warding off and battling the local armies of the Opium Triangle nations trying to get them out. In addition, the Kuomintang served its own economic interests and those of the Chinese communists by international marketing of a huge wave of cheap goods in the 1960s labeled as "Made in Hong Kong" but in fact made in mainland China. Both sides made profits, so nothing was said. Meanwhile, the state Kuomintang Party in Taiwan became well-known for its continual military policing of Taiwanese cities, suppression of native Taiwanese, rigged elections, voter coercion, and corrupt business deals involving top government officials. The Kuomintang made its first big wodge of money in Taiwan by "privatizing" (taking over) the elaborate public social service system left behind by the Japanese occupiers. Like mainland China had been, Taiwan became a two-tiered society sharply divided between the rich and the poor while native Taiwanese were murdered an driven into the mountains, developing a after 1949 a new system as corrupt as the political setup that drove the poor of the mainland China into the hands of communism before 1949. One source indicates that the Kuomintang party itself was officially founded 1912.Aug.25 in Guangdong province (and renamed the Chinese Kuomintang Party 1919.Oct.10 in Shanghai). The August chart clearly validates the following events through solar arc direction. The Kuomintang’s dream of return to China nearly came true after incessant lobbying to have the United States intervene in the Vietnam/Indochina war. During this highly controversial war, while American families were sharply divided over American military involvement there, the ultra-wealthy Soong-Kuomintang machine lobbied to continue the war, exaggerating the importance of the situation to Americans, in hopes that American troops would be used to invade and retake China. In addition, Kuomintang members in Taiwan reaped millions of American dollars from war-supply contracts, as well as from its Opium Triangle connections in producing/distributing addictive drugs pumped into the war zones for consumption by American troops. Kuomintang Chinese Mafia invested heavily in the Philippine Islands, and its money was highly integrated into the corruption of the Ferdinand Marcos regime (which also lobbied heavily for, and profited quite substantially from, the Vietnam war). The Kuomintang eventually exerted substantial control over the Marcos regime, explaining the regime’s ultimate bizarre indifference to the Philippine population, subsequent unpopularity, downfall, and expatriation under the protection of ultra-conservative allies in the American Republican Party. Note also that the early history of the Kuomintang involves Hawaii, where further connections might reveal interesting insights as far back as World War II. The American movie "Chinatown" was not a mere fabrication, but a dramatization of the crass realities of the centuries-old Chinese Mafia with which Chiang was closely aligned. Reports on these problems, and their implications for American politics and society, were publicized by San Francisco journalist Henry Liu in the 1980s, who as a result was assassinated outside his own home, after being framed and accused of being a Communist agent. (By 2005, virtually no information on this horrific scandal can be found on the internet, as it was erased.) As late as 2000, the Los Angeles Police Department issued reports on the near impossibility of keeping Chinese Mafia drug trafficking under control. Recent vote-rigging at election booths in San Francisco, and siphoning of public education funds through abuse of the voucher system and building contracts has led to increasing corruption and deterioration of the local infrastructure. Aggressive Kuomintang real-estate interests (the Soong’s specialty) have virtually swallowed San Francisco whole, while inexpensive illegal arms from East Asia are sold under-the-table on the streets, and Chinese Mafia goons working in both state and federal government agencies make identification cards and papers easily available to illegal immigrants, continuing similar long-time practices from China and Taiwan. The Chinese Mafia has also held significant influence over administation of the privatized aspects of the US Postal Service in some cities, administering the distribution of long-distance written communications and postal distribution of identity documents and other documents vital to regional and national infrastructure. If honest Chinese-Americans living within the closely-knit Chinese-American community say anything about the corruption, the repercussions are severe, including job loss, frame-ups, character assassinations, harassment by gangs manipulated by them. If non-Chinese locals say anything, they are dismissed as being racist and/or similarly harassed. And so the corruption festers, assisted my mafia contracts in computerized infrastructure database development and administration. Since the ruthlesslessly hushed Henry Liu scandal, the Mafia-linked Kuomintang Party has skillfully divested its millions into enterprises with other names, and gone underground while creating a ‘new image’ (details of divestiture to be further tracked) to conceal its influence. In short, the huge, corrupt financial empire built by Chiang Kaishek and his Soong in-laws has not gone away, but rather further grown at an accelerated pace as a result of investments in East Asian sweatshops flooding North America and Europe with inexpensive goods, and now even being operated in North America. Many often argued that support of the Kuomintang was preferable to allowing a communist regime to remain in China, but the Kuomintang in recent years, taking note of the Communist Party’s increasing wealth, has struck up an increasing number of business alliances with them. Wherever the money is, goes the Kuomintang. A Kuomintang-Communist alliance could lead to the real manifestation of the "Sleeping Giant" concept periodically referred to in the American press since the 1950s. As the severity of Kuomintang-Tong corruption was publicized in the 1980s by the subsequently assassinated Henry Liu, the Kuomintang rapidly divested assets into more obscure companies to "save a face", so its considerable economic and political influence could not be so readily detected. This has been further complicated by the fact that, at least in San Francisco in the early 21st Century, those born in Taiwan could obtain US Passports indicating "China" as their native country from privatized Passport offices under Chinese mafia control, smokescreening where they came from. There are still unresolved questions over the role of this cartel in the corruption scandal surrounding the recent 'merger' (de-facto privatization) of the University of California and the Stanford university-corporate complex (including controversies over diversion of funds into certain types of genetic engineering). In closing, it should again be emphasized that not all Chinese should be held accountable, any more than Americans should for the policies of American criminals and thugs, all Italians should for the Italian Mafia, all Japanese for the Yakuza, or all Germans for Nazism. However, the prospect of a corrupted and opportunistic right-left coalition politico-financial machine in control of China, along with its burgeoning assets in North America in the 21st Century, could be a far more ominous threat than a solely communist government in Beijing. Take a look at the rampant gentrification and decay of local government institutions in San Francisco or Vancouver or parts of New York to see what happens when the machine runs loose, unmonitored. The results are clearly antithetical to democracy. And if you don't think the South Chinese mafia is a big deal, search the internet for all the reports in the Pacific and in Canada, where the press isn't bought off or pressured by deceptive cries of 'racism' when the crime is reported. - Asian-Pacific Post #9, Nov 2005: "Chinese Mafia Spins Web in South Seas". This article has been shut down and moved at least once -- do an internet search for the title if you do not find it. - Bibliography of Books and Papers on Chinese and Japanese Mafia Today, including US Government crime research: This material also has been moved around on the internet at least once -- search web for "mafiachina.htm"
- Seagrave, S. "Lords of the Rim"
- Seagrave, S. "Asian Money"
- Seagrave, S. "The Soong Dynasty"